Four days before we flew we had to change our plans and make new accommodation plans (don't ask, but suffice to say our original villa cancelled us), what could have been a disaster turned into the best thing that could have happened to us. Via Air BnB we stumbled across and booked a villa called the 'Old Clove House'. We booked immediately and hoped for the best. On arrival we couldn't believe our luck, the house was outstanding; beautiful both architecturally and by design. 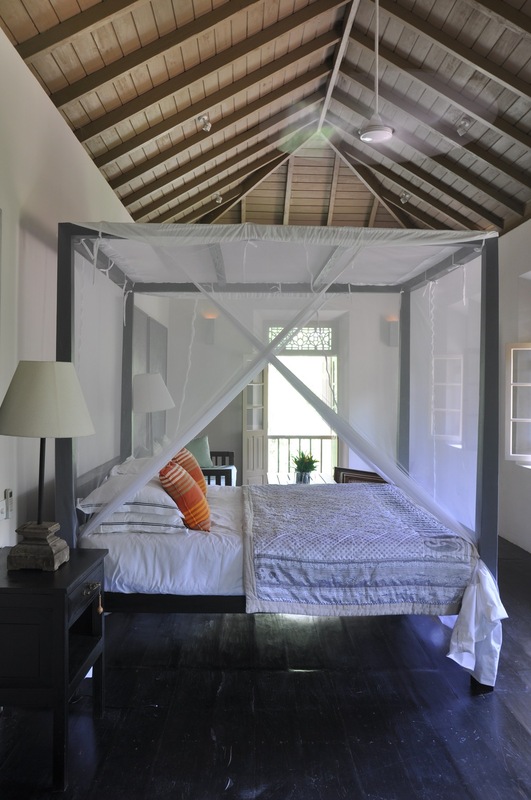 Once the house of the village headman, it is located in an old clove plantation and has been renovated, restored and modernised. 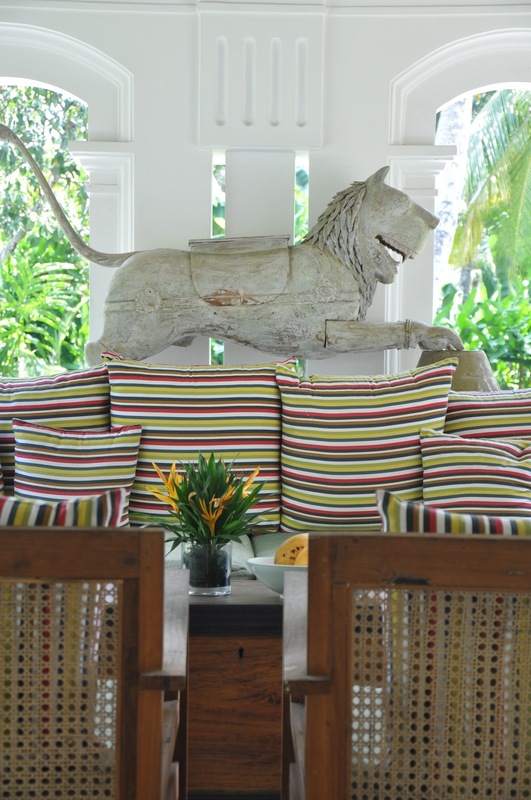 The house is located in a large leafy garden tucked off a quiet road just minutes by tuk tuk to Wijaya Beach and fifteen minutes to Galle Fort. Every detail of the house had been thought through. It was light and airy with large central circulation spaces, beautiful tropical flowers and greenery adorned the rooms. Art work and sculptural pieces made focal points in the garden and inside. Outside showers allowed you to be a part of the jungle at all times, never missing the sounds of the monkeys in the trees or the crickets in the garden. The house was run by its owner and a team of local Sri Lankans, who seemed to be capable of preparing the most exquisite food at every meal time, keeping the house pristine, giving us tuk tuk rides to the beach and town while finding time to play with our girls on a regular basis. Whether someone would run off to climb a tree to bring us fresh coconuts if the needs be or deliver a much needed pot of ceylon tea in the afternoon, nothing ever seemed too much trouble. The dining area set by the pool was a perfect place to sit in the shade to enjoy the fresh fruit, egg hoppers and coconut pancakes that were prepared for us at breakfast, and at night with the pool lights on and soft lighting the delicious curries and fresh fish were a real treat which we hope to rush back to as soon as we can. Infact the food was so insanely good with all of the fresh herbs and spices that I don't know what blew me away more. The house and decor or the meals!? 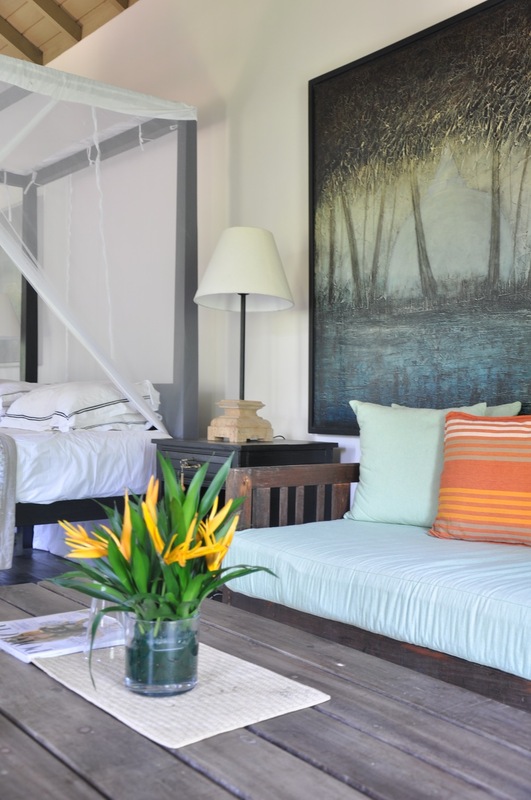 The three bedrooms were all decorated with stunning four poster beds draped with mosquito nets, huge pieces of art were calming on the walls while over head fans whirred (or aircon on the hottest of night). A fabulous, deep outside pool was heaven on a daily basis as the days were hot and it served as constant refreshment, set within the garden, with sun loungers beside to kick back and relax. I hope to have shown you a little of this stunning property through my pictures. This is not a sponsored post, I just feel that the villa was so beautiful that it is worth sharing, I hope you enjoyed it!